A manually-operated hydraulic rams was invented by John Whitehurst in 1772. French balloonist Joseph-Michel Montgolfier developed a self-acting device to pump water, for which his friend Matthew Boulton was awarded British Patent 2207 on his behalf on December 30th, 1797 for an "Apparatus for raising water and other fluids." 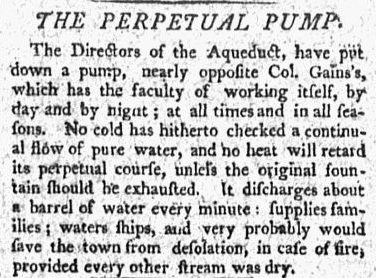 The first known use of this device was in the Portsmouth, New Hampshire aqueduct in late 1798, which called it a "Perpetual Pump," which could lift "a barrel of water every minute" and received wide notice in newspapers. This pump is not mentioned after 1799 and was apparently the only hydraulic ram used on a public water supply system until 1850, when a pump was reportedly installed to supply "20,000 gallons of water a day" to the town of Naples, New York. The town of Media, Pennsylvania installed a ram in 1854. Another hydraulic ram was installed by William Dryden for the Los Angeles Water Works Company in 1861 to pump water into a reservoir, but Dryden also installed a water wheel it remains unclear how these two devices interacted. Several hydraulic rams were installed in small water works systems in the 1890s. Page 145: The celebrated Montgolfier has just made a great discovery in hydraulics; it is a means of raising water from the beds of rivers by the simple movement of the stream, without either pump or wheel. I know him well, and have seen his model frequently at work. It is forty feet high, and consisting of only two tubes, extremely simple. [Partial translation of patent from 1936 article, cited below] "About a year ago, reflecting upon certain natural phenomena, the cause of which did not seem to us to have been explained satisfactorily, such as the greater rise of the tides on certain coasts than upon others; the projection of the water of a jet above the level of the basin whence it originates at the moment when the jet is turned on, and the projection of the waves of the sea against a rock when they meet a more or less inclined surface etc., we recognized that the true cause of it was the movement acquired, and the hammer blow produced, by the arrest more or less sudden, of this movement. It is this effort that we designate in the memoir under the name 'coup de bélier'; and we call the column of water shut within the pipe 'bélier Hydraulique.' ... "
"The trial that we have made of the ram, although imperfectly executed, has completely answered to theory, and it is with the greatest satisfaction that we have seen it succeed, and we have felt that the construction, full size, presents proportionately more advantages and much less imperfections, such as friction, leakage through the valves, etc." "I now take the liberty for myself to ask whether yourself or Mr. Watt have made any models or real Machines of the Invention you have lately patented for Argannd & Montgolfier for raising water, as I should be happy to see it, or to procure a model executed with your improvements to take to America for my own and Mr Fulton's use; as we were both present at the experiments in Paris made by Montgolfier & Argannd & Mr. Fulton has purchased of them the patent right for America & I am sure would be glad to receive a model of it thro' me as he goes direct to America." 1798 "The Perpetual Pump," Portsmouth Oracle of the Day, December 22, 1798, Page 3. The Directors of the Aqueduct, have put down a pump, nearly opposite Col. Gain's, which has the faculty of working itself, by day and by night; at all times and in all seasons. No cold has hitherto checked a continual flow of pure water, and no heat will retard its perpetual course, unless the original fountain should be exhausted. It discharges about a barrel of water every minute; supplies families; waters ships, and very probably would save the town from desolation, in case of fire, provided every other stream was dry. 1799 "Aqueduct," Portsmouth Oracle of the Day, May 18, 1799, Page 3. The Directors of the Aqueduct have broke ground for the season, and are going on to finish the intended work. – Our perpetual pump, a few weeks since, ceased to emit water; – the fault was soon discovered, and easily remedied – It now yields the copious stream, as usual. I recd. in Paris, an example of the Hydraulique belier a machine for carrying water to any height above the reservoir, of Peter Whitesides,* for the President, which I ought to have forwarded to him immediately on my arrival here. I shall commit it to Mr. Pinkney. Mr. Whitesides wants to obtain a patent for it, and I hope if permitted by Law, that the delay will not deprive him of the right. I think he gave me a paper explanatory of its powers; I cannot now find it, but will send it hereafter if I have one. He had sent one to me at Richmond with such an exply. paper, wh. may I presume be had, as the instrument may, if this shod. prove defective. *British-born Philadelphia merchant Peter Whiteside (1752–1828) made a fortune as a contractor and supplier of the Continental army during the American Revolution. After moving to France in the early 1790s, he performed much the same function for the revolutionary government in Paris. No patent for Whiteside’s hydraulic ram has been found. There has been a mistake between M. Le Poype & yourself as to a letter from me to the National institute. 1805 Morning Chronicle (New York, New York), November 16, 1805, Page 3. This is the approbation given by Mr. Jefferson to the invention of the Hydraulic Ram, which was offered by Mr. Lapaype, to the inhabitants of Richmond, for the utility and ornament of that city; and of which he has made also some experiments at this house at Monticello. Balt. Amer. Mr Poype having obtained from mr Montgolfier the inventor of the Hydraulic ram permission to use his patent right to the advantage of mr Poype who has need of it, I do not think myself at liberty to make any communication of it’s construction to his prejudice. on the same ground I have not put to use yet the one he permitted me to have made from his model. I understood there would be a subscription in Richmond for employing mr Poype in the setting up a number of them, which will give to the city the benefit of the construction. I beg leave to propose to your Excelency what I think an Improvement to the President’s House. It is Montgolfier’s hydraulic ram improved, for which I have lately with a partener, obtained a patent of the United States. Dr. Wm. Thornton examined it Very Carefully, witnessed Some trials and was So kind as to take an active part in the Experiment we have exhibited in the City. I have long since made the drawings for your Belier hydraulic but I wished to do more than make a drawing, I wished to send you a working model but together with procrastinating workmen and my own moving from place to place I have not yet been able to accomplish it. If your men can work from the drawing I will forward it from New york. I am thankful to you for the trouble you have taken in thinking of the belier hydraulique. to be put into motion by the same power which was to continue it’s motion was certainly wanting to that machine, as a better name still is. I would not give you the trouble of having a model made, as I have workmen who can execute from the drawing. I pray you to accept the assurances of my great esteem & respect. I recieved yesterday on my return from a journey your favor of Mar. 28. and have to thank you for the drawing of your self-moving belier hydraulique, which a first reading shews to be simple & ingenious, & I have no doubt will answer. it shall have my early attention. I have to thank you for the drawing of the beautiful hydraulic machine with which you favored me in yours of Jan. 11. in simplicity and effect it promises to go far beyond Montgolfier’s hydraulic ram. 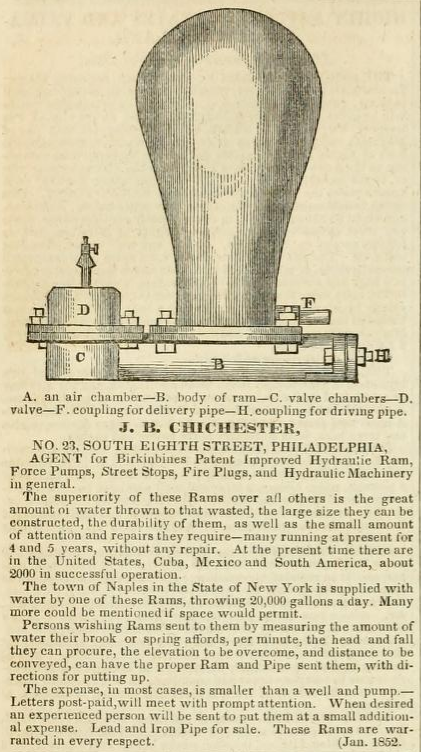 1852 "Hydraulic Rams," Scientific American 8(7):53 (October 30, 1852) Communication from J.D. Rice questioning accuracy of September 25th article. 1873 The Salmon Run Water Company built a system in Granby, Connecticut that pumped water using a hydraulic ram. 1884 "Rural Water Supply," by Charles L. Hett, Engineering News 11:226-227 (May 10, 1884) includes details on hydraulic ram calculations. 1885 Descriptive Catalogue and Price List of Pumps, Engines, Rams: And Other Hydraulic Machinery and Iron Goods Manufactured by the Goulds Manufacturing Co., at Their Works, Seneca Falls, N.Y., U.S.A.
1890 Manual of American Water Works, Volume 2. Page 150: Red Lion, Pennsylvania. Red Lion Water Co. projected, pumping to reservoir 225 feet above, by hydraulic ram. 1891 Manual of American Water Works, Volume 3. Page 401: Wolcottville, Indiana, built in '89 by Wolcottville Water-Works Co. for fire protection. Supply, mill-race, pumping by means of hydraulic ram to tank. 1897 Manual of American Water Works, Volume 4. Pages 524-525: Texas City, Texas, Built in '96 by Inman Terminal & Dock Co., for the fire protection of their cotton sheds and warehouses. A 24,000-gall. hydraulic ram lifts water. The Hydraulic Ram for use in Public Water Works Systems, by Daniel W. Mead, Rockford, Ill. Page 75: [Description of invention and partial translation, included above with 1798 French patent] Brevet d'invention de 15 ans pris le 13 brumaire An VI (3 Nov. 1797) par Montgoifier et Argand; brevet de perfectionnement et d'addition delivre le 7 prairial an VI (6 May 1798). Brevet d'invention de 15 ans pris le 7 prairial an VI (26 May 1798) par Montgolfier frères et Ami Argand. The last-named patent specification alone has been printed, see Description des Machines Sér. 1, Vol. IV, 245; incidentally it constitutes really a memoir on the subject. "Pursuant to your request I called on your Attorney Mr. Weston who obligingly gave me two Copies of the Specification of the Belle Hydraulic (sic) for which I feel myself highly obliged to you; I very much agree with you, so far as I understand it, that it will not soon or readily be applied to common uses & this I thought at first seeing it at Paris. However, it is an invention highly ingenious & when I visit Birmingham I will certainly avail myself of your kind offer of visiting the one you are erecting at Soho." Gilpin, however, did not find time to pay the projected visit. The reference to Fulton is highly interesting but as far as the writer is aware he never did anything with the ram in America.